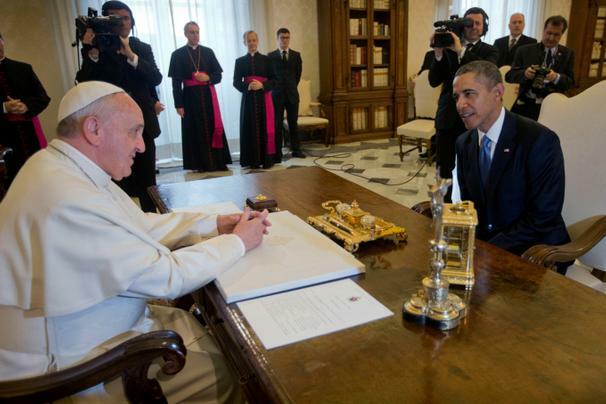 Did you catch the news stories about U.S. President Obama meeting Pope Francis earlier today? While I have trouble imagining that the so-called “leader of the free world” meets with just anyone, given his hectic schedule, it’s interesting how far the press goes, in a curiously coordinated effort, to reproduce the rhetoric of simplicity that is so important to reproducing the authority of the Pope — all the while ensuring that we also know he’s important enough (and equipped) to entertain world leaders, of course. For example, with the precision you’d expect from pundits sticking to the day’s talking points on cable TV, all sorts of media outlets have judged it necessary to inform readers not just that the two met, or that they sat at a desk while they met, but the qualifiers “wooden” and “simple” appear all over the news to qualify that desk — as if that’s news. But given Francis’s reputation for apparently bringing a version of liberation theology to the Vatican, I guess the adjectives are doing important rhetorical work (and the media does that work for free! ), for something’s got to keep our attention on the message and not the medium in which it is delivered — which is, let’s be honest, a rather palatial setting, no? It’s comparable to calling the high tech, militarized mansion (palace?) in which Obama now lives and works just “a white house” — though inserting the caps makes all the difference; it’s kind of like here in Alabama when I met some younger people for the first time, they’re often instructed by their parents to call me “Mr. Russ,” getting the benefit of first name intimacy while also all the distance (and authority) of the formal title. This way you get to have your folksy cake and all its decadent frosting too. I’m sure there’s all sorts of simple wood beneath the gold leaf at the Vatican. Perhaps the media will report on that sometime soon.